Located in the quiet village of Oracabessa, Goldeneye is an 18-Acre, All-inclusive Resort set in The rural and dramatically scenic St. Mary Parish of Jamaica. Perched among tropical forests and lush gardens on a seaside bluff overlooking the Caribbean , Goldeneye offers a dramatic coastline of secret coves and private beaches along with exclusive accommodations. Oracabessa, inspired by the spanish name Orocabeza, or "golden head," is a friendly one-street town with a produce market and a few shops and bars. In the 1990s, the island outpost corporation bought 70 acres of prime coastal land and opened the village's main draw, the James Bond beach club. East of the turn-off for the club is Goldeneye, the unassuming white-walled bungalow where Ian Fleming wrote almost all of the James Bond novels. 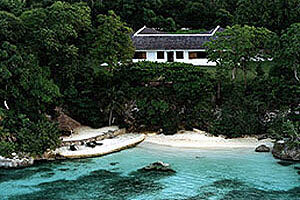 Today the bungalow is part of the exclusive Goldeneye Resort.